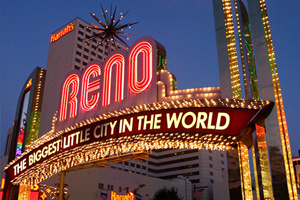 Known as the “biggest little city in the world” Reno is in Northern Nevada and is famous for its gaming and casino industry. Before the 1950’s Reno was the country’s gaming capital, however the growth of Las Vegas in the past 20 years has reduced its influence. Other industries have grown in Reno, including education, healthcare and commercial development and construction. Gaming and tourism, however, continue to be the primary economic drivers. If you run a service based business in Reno, Nevada, you are aware of the importance of excellent customer relations. Keeping connected to your customers – both existing and potential – is a vital component of customer service. Missed calls and poor telephone management lead to a bad reputation… so if you require professional answering services in Reno, look no further than Sunshine Communication Services, Inc.
A busy tone and recorded message are detrimental to your business’ reputation. Our answering services ensure that your clients receive the attention they need when they need it. Switchboard, messages, appointments, and a professional and friendly first impression… our virtual receptionist offers all the benefits of in-house staff without the expense. When the phone won’t stop ringing, it’s hard to get your work done. Increase your productivity with our virtual answering services. Outsource your call answering and free up time, save money and project a professional image with your own dedicated call center phone line. Great for small businesses who are experiencing growth but can’t afford the expense of extra staff, our phone services help you manage your customer communication in a cost-effective manner. Whether your customers would prefer to speak in English or Spanish, our call center agents can communicate effectively in both languages. You keep standard operating hours, however, your customers’ needs may fall outside of these. Keep the lines of communication open with after-hours call answering: 24 hours a day if need be. With Sunshine Communication Services, Inc. you are assured of professionalism that goes beyond other answering services. We customize our service to your business’ needs and budget by providing industry-specific trained bilingual agents that are available for the hours and days that you require. Our agents are also HIPAA accredited to deal with all kinds of questions that may arise over the phone. You receive your own dedicated phone line and our services are available 24/7. Any urgent messages will be directed to you promptly, with all other communication delivered to you via your choice of email, phone, text or fax. If you want to find out more about our personalized telephone answering services in Reno, contact us at Sunshine Communication Services, Inc. today.